Bridge Cottage01263 715779work01603 870304fax Self-cateringBridge Cottage is a characterful building, tucked away in a quiet spot next to the River Stiffkey, in one of north Norfolk's premier coastal villages. The cottage has been refurbished to a high standard and downstairs offers a beamed sitting/dining room with woodburner, a well equipped kitchen, large utility/boot room and good sized bathroom, which also has a separate shower cubicle. A traditional, steep, twisting staircase in keeping with the age of the property leads to two bedrooms and a cloakroom. Stiffkey has a quirky village shop, church and a pub and the natural gems of Cley-next-the-Sea, Blakeney and Brancaster lie along the coast in either direction, whilst inland the Georgian town of Holt and the popular village of Burnham Market should not be missed. With beautiful views across the Stiffkey Valley to the front and a pretty river edged garden to the back, Bridge Cottage is ideally placed for seeing this beautiful part of the county. Bridge Cottage offers weekly bookings starting on Saturday. 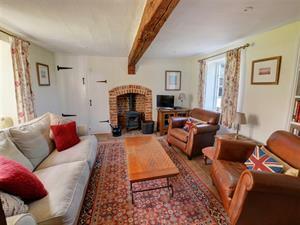 Bridge Cottage is a characterful building, tucked away in a quiet spot next to the River Stiffkey, in one of north Norfolk's premier coastal villages. The cottage has been refurbished to a high standard and downstairs offers a beamed sitting/dining room with woodburner, a well equipped kitchen, large utility/boot room and good sized bathroom, which also has a separate shower cubicle. A traditional, steep, twisting staircase in keeping with the age of the property leads to two bedrooms and a cloakroom. Stiffkey has a quirky village shop, church and a pub and the natural gems of Cley-next-the-Sea, Blakeney and Brancaster lie along the coast in either direction, whilst inland the Georgian town of Holt and the popular village of Burnham Market should not be missed. With beautiful views across the Stiffkey Valley to the front and a pretty river edged garden to the back, Bridge Cottage is ideally placed for seeing this beautiful part of the county.